so, i just, just this now, this very minute, pressed send on an email that contained a book--a whole book that i wrote!--to an editor, who, bless her heart, is going to have an awful lot to wade through in the coming weeks. all this to say.... it's finished, it's done! it's off to be hacked into pieces and made much much better by a group of professionals that know way better than i do, and though it's not entirely out of my hands--there's still work to be done in the coming months before it's released next year--this part, this hellish, wonderful, intensely awful and beautiful part, is over. i'm still waiting for it to hit me. it isn't hitting me yet. i still feel like at any given moment i'm letting a hundred things slip. i'm sure once it does hit me i'll get sick with a hundred random viruses all at once. this is what happened to my friend shane this year when he finished his book. (his book is going to be way better than mine.) suddenly he had strep throat and bronchitis, like his whole body was purging the stress the one way it knew how. i wanted to say first of all how grateful i am for all the wonderful support i've gotten. from my husband, from my mom, from all of you who have sent so many sweet emails and have had so many words of encouragement for me. i am so grateful! (i'm also grateful to the sponsors i took on this season, thinking for sure i'd have finished it by now, who have been generous in scootching deadlines around for me.) this has been a weird and wonderful time, i feel so lucky to have gotten it. i put a lot of pressure on myself to honor the readers who have read this blog for a long time and feel like they know me. i wanted to write this book for them. i wanted them (you) to know what it means to me to have had this support over the years. i also wanted to write this book for me. for my husband and for my mom and for my dad and for my huck, these people who are my cheerleaders, who saw this opportunity and wouldn't let me turn it down, who were so excited for me, and patient with me, people i actually know and can see and touch. i also wanted to write it for my editors, you know, since they asked me to write it in the first place. and i wanted to keep this space trucking, too. i wanted to be able to do it all. of course i couldn't, but you know what, i'm okay with it. i'm at peace with that. i know who i am. i know what i stand for. but i felt sad for the readers who were coming here and thinking i was gone, when really, i was here all along, thinking of them and praying for them and working really hard hoping all this nonsense worked out in the end. this process of writing a book has made me face a lot of my worst fears. it's mildly terrifying, offering myself up the way i do. by some grace of god i was able to keep up with everything at home through all this. the house stayed clean, my family stayed fed, i didn't get the kind of time with huck i like to get but i did get "enough," whatever that means. but, anyway. that's life isn't it? Congrats!! Can't wait to read your book! Your blog is a daily read and I look forward to continuing to follow along. All the best, brave girl!! Congratulations!! What an accomplishment! Thank you for sharing your life with the world--it brings joy to my day. Can't wait until the editor clicks 'publish' and I can pick it up at bookstore in the near future. I absolutely love reading your blog and following along with your adventures. I've recommended your blog to many friends and will be doing the same when your book comes out, I'm sure! We are here! We love you! Congrats! Love you and am sure I will be lovin' your book! Thanks for keep keeping on! And I can't WAIT to read it! Your blog is so approachable and wonderful in its freshness and honesty. I've enjoyed being a reader for a long time, and I promise I will devour your new book with the same gusto in which I devour your blog posts. Congratulations! So exciting and beautiful and wonderful!! Just love it and I can't wait to see as your book progresses. Your book! How awesome is that. Someday I'll be sharing those words with you. Congratulations!! You are so brave to share your heart and life with the world and so kind to be thinking of us as you do. You are amazing! Congratulations! I can't wait to read the book when it come out! I'm sure all your loyal fans have stuck around and are happy to see you back on the blogging bandwagon. Such an awesome accomplishment! Can't wait to read it! As I was reading I thought you were going to announce you were closing up shop. I'm so glad that isn't the case. Even the silliest of posts are still so sweet and entertaining and so uniquely you! I'm a relatively new reader, and I'm happy to read what you put out there. BUT - lady, you wrote a book. Someone paid you to write a book. Stop saying its a mess or someone else's book is better - yours is good! Own that! Few of us, if any here, have ever written an entire book! For real cash money! Be proud! Be sad! Be proud! Writing a book is so brave! Congratulations. I can't wait to read it. Congrats! What an accomplishment, lady! Woohoo! Congratulations! I love this blog and I've loved following you on this journey (in a non-stalkerish way). So looking forward to reading the book. Please, if you wouldn't mind, -the subject of your book? Congrats! I can't wait to read the book. i have read your blog for ages now and cannot wait to read the book. HUGE congrats to you! what an accomplishment! Congratulations! I really enjoy reading your posts, so I know your book is going to be packed with more good things, fun, philosophy, frustrations, and joy. I love reading about your joy amid all the chaos of life. I hope there are pictures. I love your family pictures. I just adore you Natalie. You're such a talent and one of my biggest girl crushes. :) Keep doing what you do I cannot wait to read your book, congrats on finishing it!! Can't wait to read this fabulous book! I know it's going to be great. Huge Congratulations! Congrats!!! You are amazing! Can't wait to read the book! Just know your readers are so proud, and so happy with the work you do. You are so talented, so authentic, and so real with what you choose to give to your readers and it's extremely obvious your heart is full of love. So don't let your worries or your stresses overshadow your successes. You do you, girl. I love a good cry in the shower! Congrats on finishing the book. Can't wait to read it next year. Go ahead and have a good cry! Ad as long as you're writing (blog, book, or anything else) I'll keep coming back to read it. congratulations on the book! i can't wait to read it. I've been a reader for a while and I'm so excited for you Natalie! Congratulations on the book - I know it's a huge project. I can't wait to read it! I work in publishing, and so I know what a big deal it is to write your first book. First-time authors are actually my favorite because everything is new and exciting; they don't take the process for granted. :) Congratulations to you, Natalie. This is such a big achievement. And let me just say that crying in the shower is totally underrated. Boy, I certainly have my moments when that's the only thing that helps. YAY! A book! You should be so proud of yourself. I can't wait to read it. Crying is the best. Last summer a visiting friend led us in a magical yoga session outside in the grass on a 90 degree September evening and at the end, I felt all the tears in the world welling up and just wanted to let them go and cry on my mat in child's pose for hours, but we had to hurry and get cleaned up for dinner and I didn't want my face to be all red and puffy so I held it in. I still think about how much I wish I had just let it go because my god, that would have been the best cry ever for all the best reasons ever. So don't ever keep it in. You are amazing, and I have loved reading you all these years. Do it for you, and thanks for doing some for us. Congratulations!! Holla!!! You did it! So happy for you. Seriously, what an accomplishment! You are such a delight, I love getting to read what you post here. Thanks Natalie! Congratulations! That is a major accomplishment and your hard work has obviously paid off! All the best to you and your book! Congratulations, Natalie! I have been reading your blog for years, and I am SO excited to see the finished product of your labor. I KNOW it will be amazing. Congratulations! I've been reading your blog for years and I am very excited to read your book. I'm a fan! I'm a supporter! I don't know you but I feel like I do. And I completely relate to the juggle of "it all." And I totally relate to the terrifying element of putting yourself out there with your writing. I'm in the process of deciding how much to put out there of myself in a new blog project I am working on with my husband. It's sort of scary and weird and wonderful ... this internet thing. My writing may be total crap but my husband's photos are lovely. Congrats! WOuld love to read it! nice post! I've only commented one or two other times but I couldn't NOT comment on this post. :). Congratulations! I'm so insanely excited for you yet I have never met you. I've been so impressed that you have been keeping up your blog, while being Mom, Wife, etc and WRITING A BOOOK! I'm so excited for more details on your book and of course the real deal next year. Way to go, Natalie! SO EXCITED !!!!!!!!!!!!!!!!!!!!!!!!!!!!!!!!! Congratulations!! Can't wait to read it. this is the most exciting thing ever. what an INCREDIBLE accomplishment. oh, i can't wait to read the book!!! How amazing!!! I seriously cannot wait to read it. Now go color in a freaking coloring book on the floor. :) Big big congrats to you, Natalie. Congrats congrats congrats!! Am already dreaming of turning those pages!! You are amazing. SERIOUSLY. Amazing!! Congrats! We love you! YOU GO GIRL! Get that cry out, a good cry always feels good. By the way, I think of this just about every time I swing by this space of yours: for every negative Nancy that feels the need to put you down, there's 100 more women (and men!) that so appreciate your voice, your honesty, YOU. I'm sure you've heard this before, but thanks. Suriously. Thank you. Crying in the shower is a huge stress relief for me too! I am so excited for your book. Major congrats! Congrats on the book! Can't wait to read it. I think you said it all when you say "the house stayed clean, my family stayed fed, i didn't get the kind of time with huck i like to get but i did get "enough," whatever that means. but, anyway. that's life isn't it?" so don't for a single moment think anything less of yourself. That's all that really matters in life. And you wrote a book! So, seriously, I kind of think you are a superstar. Also, I can't wait to buy your book. So hurry those editors along, now. We're all eager to read it!!!! Catching glimpses of your soul here, in the words you weave and the stories you speak, has unexpectedly become a part of my everyday. Just thought you should know you're doing good. And should this space slip for the sake of real life living... Well, I think every honest mother, wife, daughter, woman & human finding their way in this world would only respect you all the more. You did it! YOU did it! Love this post. Love how you captured the relationship between you and us (your readers). It's funny and sort of strange how we can become invested in a person's life just through their words, despite being very far apart geographically, and actually not having very much at all in common, and yet I am among those who have done so with you. Rooting for you always and especially now, on such a mighty-est occasion as this--the feat of having scribed a whole damn book. You are a class act! Well done ! amazing!!! Congratulations - cant wait to read it! Im currently reading 'Man Repeller' Leandra Medine's book and must say loving it - its always a treat to read bloggers books! Natalie, a BIG congratulations on finishing your book! Well done you. Not only on writing a book, which in itself is awesome, but also on accepting that we can't be everything to everyone all of the time. You can only be the best that you can be. And you're doing that just fine. oh my gosh i can't wait to read it! so excited. Bravo, Natalie, bravo!! What an amazing accomplishment! This little faithful reader is SO proud of you, I can only imagine how proud your family must be feeling. Thank you for sharing your beautiful life with us. CAN. NOT. WAIT. to get my hands on your book!! Well done :) Your blog is rad, you're rad, your family is rad, and real, too. I like that we get to see not just the good, but sometimes the crappy too. It's been good for me, so thanks. Have fuuunnn celebrating. Congrats Natalie!! That is such a great accomplishment. I seriously can't wait to read it now! You really know how to make your readers feel loved! I hope you know how proud all of us are of you! Seriously, a whole book. That's a huge deal! I can't wait to read it. I know you will be brilliant! Wow! Well done you! It's clear from your blog how much you love writing and your family - it's so hard to juggle it all, and even harder when you are freelance / work from home, in my opinion. I hope the book does really well for you! I can't WAIT to read it! You are a beautiful and entertaining writer! Well done!!!! Enjoy some great quality time with your fam - you definitely deserve it! Congrats! I cant wait to get that book in my hands! I know its going to be great! Honestly I think you did really well while you were in your writing season. You never disappeared and we knew you were writing! :) Much love!! Hi Natalie! I am so excited for you! I cannot wait to get my hands on a copy as I know it will be fabulous! Congratulations! Congrats on finishing your book!! I can't wait to read it; also, your friend's book. If he's your friend, then I'll bet it's good, so maybe you could post about it when it's published? Anyway, I have missed your more consistent posting but at the same time I feel like it's made the posts you do share that much more special. I don't know you personally, but to me you're pure gold. Congrats again!! Congratulations and know that you always exceed my expectations. Natalie, your the best, I love that you stay true to yourself, even if rude comments get you down. I don't think people put themselves in your shoes when they say those things. Anyway congrats on finishing your book! I look forward to reading it. Keep being who you are! This post just encapsulates so many feelings of women and mothers...feeling proud but nervous, stressed but happy, missing your child but also knowing what you are doing is for them, etc. And then just crying because you have nowhere else for all that emotion to go. I know I am excited for your book and for you. this is so inspiring. it kind of bugs me that there were some comments made that were upsetting to her when there should be nothing but support flowing in. being a mother, and one who contributes to an income at that, is all about making sacrifices. natalie owes nothing to anyone. only her family. i'm glad she remembered that. wonderful human being and mom. bravo. Congrats! An accomplishment you should be very VERY proud of. Congratulations! I have been following you for a long time now and this is my first comment! As soon as this book is on amazon, I'll order it and make it come to France so I can read it! Can't wait! SO EXCITING! Capslock was obviously necessary. Ms. Natalie Jean, you wrote a freaking book, and I am going to speak for us, all of your people, when I say how can we be disappointed when you've done something so fantastic and wonderful? You've been so upfront about all the work you've been doing, obviously everything was going to be stretched a bit thinner, and you've done it and now it's done and I, for one, am over the moon for you and will clearly be pre-ordering this literary masterpiece as soon as humanly possible because damn girl, you wrote a book. To be real, you've probably written three books over the years of blogging but this one is going to professionals! And it will be bound! Binding is just so exciting. I feel like I'm going overboard but man, I'm so pumped for you and can't wait to see the fruits of your labor. AH! I'm so excited. It's going to be wonderful. Congratulations!! Congrats Natalie!!! I can't wait to read this book of yours - your a treat! you are just the best, natalie. i have always loved reading about your life with your sweet little family. thanks for being such a bright spot in my days. I never leave comments, but I regularly read your blog. I have found myself invested in your story and I can't wait to see how this all unfolds for you. Thanks for being vulnerable and sharing. congratulations! this is a HUGE accomplishment. looking forward to reading it and continuing to read your wonderful blog. I have been going through an adoption for the last year and though I know it is completely different than writing a book, I know that feeling so well....the weight. It is always there no matter how well you are functioning day to day. I am do glad for you that you are done! Thank you for doing what you do. Congratulations! I'm looking forward to reading it when it gets published next year! Loved this post! YAY for writing your book! That is so intensely amazing, and I'm really so happy and excited for you! :) Now for some quality Huck-Mama time, yayyy! 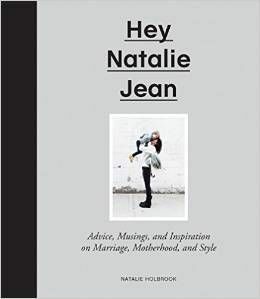 Way to go Natalie--I'm so excited for your book to come out and can't wait to get my hands on it! We're all still here rooting for you, everyday! i follow your blog from France, i m improving my English by reading your stories and even if i don't understand everything(my level is not so good) i appreciate the photos, there is so much love and happiness in it. Also the city you live in is so beautiful. Thanks for this lovely blog ! You're superwoman! I don't know how you do it all! Can't wait for this book to come out. Congrats on the book! Excited to see it in print! You are so darn lovable! I love reading your beautiful blog and can't wait for your book. Way to go Natalie! I have read your blog archives from the beginning over the last few months (and here I am! The present day!) and I wholeheartedly believe in your heart and the direction of your journey. I am grateful for your generosity of beautifully-written disclosure and thoughtfulness to the ways of the human spirit. Thank you! so excited for you! every time I came to the blog and it wasn't updated it made me more and more excited for your book (does that make me a weirdo?!) anyways congratulations! Well Done! I am so excited to read your book, plus you're going to be a published author; how exciting is that?! :) it's given me the motivation I needed to get started on my book this coming university holidays. I really like your own composing design as well as can't wait around to see your own guide! Great job! Thanks with regard to providing all of us just a little peek in your life. I am so incredibly excited to read this book! You're an inspiration and such a down-to-earth writer who can be elegant yet self-deprecating at the same time, and I mean that in the best way possible :). It's my favorite style of writing. You deserve all the success in the world and thank you for sharing this journey with us! I cannot wait to read your book! natalie! you are my very favorite writer, and i'm so so proud of you for writing a book. and somehow, knowing you were thinking about your blog readers the whole time did something to me... i'm sitting on my couch crying. you're so willing to be open and completely honest and somehow you make me feel so cared for. so thank you.